How close can workers get to the roof edge before they are exposed to a fall? When this question is asked in class, responses vary widely. Many suggest that six feet is a reasonable distance while others have told me there is no safe distance, you are always exposed to a fall whenever you are on a roof. Who's right? Both and neither, I suppose. How close can you get to a roof edge? Not this close! 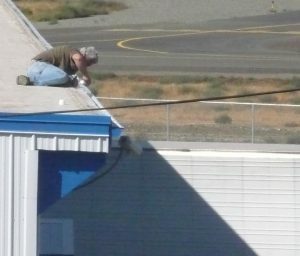 Determining whether a worker is exposed to a fall is an essential aspect of a fall protection competent person's responsibilities. When we look at accessing and working on flat or low-sloped roofs, there are many factors to consider. When you're faced with answering this question, here's the process that we suggest. Analyze the work activities. Where do the workers need to be positioned? What path do they take to get there? What about their tools and supplies? Are these areas clearly defined? Will there be pushing or pulling activities? Will they be carrying large objects that can be affected by the wind? How long will the job take? Analyze the workers. A defined edge approach distance is an administrative fall protection system. It relies on training and compliance to be effective and, according to the fall protection hierarchy of controls, is considered the worst way of protecting workers from fall hazards. If we are going to rely on administrative controls, we have to assess the experience level of our workers. Are they seasoned pros who follow directions? Or are they new hires or temporary workers who may not appreciate the hazards and may be reluctant to speak up if they have questions. Analyze the roof. Is there a parapet? (We'll discuss the use of parapets as fall protection in a bit.) How is the roof accessed? Are there clearly-defined walkways? What is the roof composition? Can it get slippery? Are there areas with substantial moss or leaf buildup that can conceal trip hazards? While we tend to treat low slope and flat roofs similarly, the presence of any slope will increase the hazards. Analyze the environment. The presence (or possibility of) wind, frost, and dew/rain can all increase the fall hazard exposure, as can working at night with inadequate light. Once these questions are answered you can begin to identify the roof locations that do not pose a fall hazard along with others where it might be possible for someone to get distracted and make a fatal mistake. If we cannot use conventional means of fall protection (guardrails, fall restraint or fall arrest systems) to protect workers in these hazard areas, how much distance do they need? Enough distance so that if they stumble near an edge, or are buffeted by a wind gust, or are pushing or pulling heavy loads, they are able to take corrective action and turn away from the hazard before they fall. This ability requires the worker to have two things: 1) some way of knowing they are actually near the edge, and 2) enough separation from the edge once they realize where they are so that they have room to trip or fall without any risk of going over the edge. So how do we warn workers that they are near an edge? Warning line systems are increasingly being used for this. Although the fall protection regulations reserve the use of warning line systems for roofing work, OSHA has written several letters of interpretation which address the use of these systems for other trades. The Troxell letter being one example. In this letter federal OSHA said the warning line (which they classify as a non-conforming guardrail) must be at least 15 feet from the edge. In a similar letter, Oregon OSHA specified the distance must not be less than 10 feet. So in a roundabout sort of way, we have answered our question. If OSHA feels that a warning line which 10-15 feet from the edge provides adequate protection, a greater distance than this would be required if we omitted the warning line. Not only that, but we would need a high level of participation from the workers to ensure that they knew the distance, could accurately estimate that distance, and remain outside the hazard area even when almost all their attention is focused on completing the tasks at hand. That's a tall order which is why administrative controls (like designating and enforcing a specific distance) are considered to be so much less effective than warning line systems, portable guardrails, or fall restraint systems. What about using parapets as fall protection? The RHGS concept was originally proposed by federal OSHA on April 10,1990 (55 FR 13360) and was republished on May 2, 2003 (68 FR 23528). The proposed language for RHGS was removed from federal OSHA’s May 24, 2010 proposal (75 FR 28861) which replaced the 1990 and 2003 proposals; however, federal OSHA is considering a new provision that would allow the use of reduced height barriers as the functional equivalent of guardrails (75 FR 28894) under limited situations. In their Interoffice Memorandum (revised 2015) Oregon OSHA says that a parapet might be acceptable as a Reduced Height Guardrail if these two statements are true: 1) the parapet is at least 30" tall and the sum of the parapet height and width is at least 48". While this applies to Oregon, if you are in another jurisdiction, you will want to find out if RHGS will be in compliance. A quick call to your local enforcement agency should answer the question.